Ford's Self-Driving Business Development Expands to Washington, D.C.
Ford is expanding its autonomous vehicle testing to Washington, D.C.
DUBAI, UAE, October 23, 2018 – Just like guiding a bill through Congress, establishing a self-driving vehicle business requires a lot of coordination. Not only do self-driving vehicles need to operate safely and reliably, but they also need to work in concert with the businesses, people and cities they serve. On top of all this, they must operate within an ecosystem that supports their operation and maintenance. As Ford’s work in all those areas continues in Detroit, Pittsburgh and Miami, we are expanding to become the first company to test autonomous vehicles in Washington, D.C., according to the district, by establishing a self-driving vehicle business – a business that will be responsive to the needs of the city and its residents. 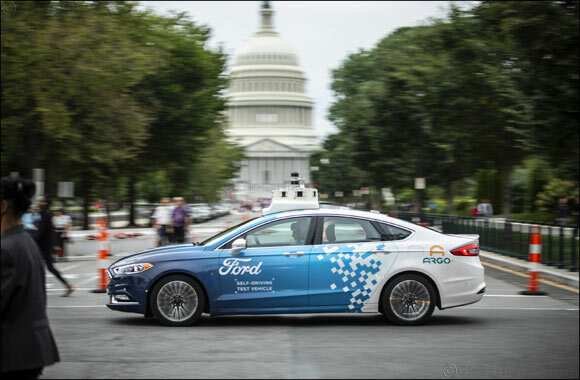 Both Ford and district officials are committed to exploring how self-driving vehicles can be deployed in an equitable way across the various neighborhoods that make up Washington, D.C., and in a way that promotes job creation. The advent of self-driving vehicles promises a chance to make it more affordable and easier for people to get to jobs by filling gaps in access to public transportation, new ways to deliver food and other products, and more. It also means change – and how we prepare for that change will greatly impact people and their communities. That’s why we’ll be working with local officials in Washington, D.C., to ensure that we test our self-driving vehicles in all eight of the district’s wards – and eventually operate business pilot programs in all eight wards as well – as we work toward deployment of a commercial service in 2021. We believe that ensuring widespread access to mobility services enabled by self-driving vehicles is vital, a sentiment that was underscored in a report by Securing America’s Future Energy, which found that autonomous technology could improve people’s access to jobs as well as retail markets. Our partners at Argo AI, who are leading development of the self-driving system, already have vehicles on district streets, mapping roads in the first step toward testing in autonomous mode. Over the next year, the fleet will grow as we expand testing areas, including within the city's downtown core. Meanwhile, we’re also collaborating with the D.C. Infrastructure Academy in Ward 8, a workforce training centre launched by Mayor Muriel Bowser earlier this year that prepares residents for a number of jobs. We are looking to train a roster of vehicle operators, who will be responsible for safely operating and monitoring our test vehicles on public roads and on closed courses throughout the development process. Additionally, we will work to train residents for auto technician careers that could involve self-driving vehicles in the future. This training will be through courses developed by Excel Automotive in Ward 7 and Ford’s Automotive Career Exploration program with support from local dealers Chesapeake Ford Truck, DARCARS and Sheehy Ford of Marlow Heights. With new technology comes new opportunities, after all, and self-driving vehicles won’t be an exception. According to the same SAFE report, a strong workforce development infrastructure can smooth over employment disruptions and “speed the evolution of worker skill requirements that will contribute to full employment and economic growth.” Acting now in preparation for the future is necessary so that we aren’t caught flat-footed as autonomous technology gains mainstream adoption. Part of that means making sure all residents have the chance to learn new skills, and we are committed to helping identify new jobs for communities as self-driving vehicles take to the streets. As we move forward with these initiatives, we’re fortunate to be working with Mayor Bowser. She and her administration have been strong supporters of new mobility initiatives, with a track record of leadership on autonomous technology. Washington, D.C., part of the Bloomberg Aspen Initiative on Cities and Autonomous Vehicles, is the first city to conduct pilots with food delivery bots, and its long-term planning calls for the District to become a test bed for self-driving vehicles and connected technology. To manage our fleet on the ground, we have also established an autonomous vehicle operations terminal in Ward 5. This terminal is where we’ll continue developing our vehicle management process, house our fleet, wash sensors and clean vehicles, as well as conduct routine maintenance and troubleshoot any potential problems. All told, this is a great opportunity to see how we can take what we’ve learned in Miami-Dade County and begin building out operations in a new city. Finally, expanding our operations into Washington, D.C., is an enormous opportunity to understand how a comprehensive self-driving business could be utilised. The city is one of the largest markets in the United States, with its population growing significantly during working hours as people commute from the suburbs or take the subway. Outside of commuters, there are millions of visitors every year, major conferences, a popular food scene, and high demand for ride-hailing and delivery services. Aside from building a fleet that can handle such a diverse workload, self-driving vehicles will also need to operate within a solid regulatory framework. Earlier this year we shared how we are prioritising safety, in “A Matter of Trust: Ford’s Approach to Developing Self-Driving Vehicles,” but now with our cars on the roads in D.C., it’s important that lawmakers see self-driving vehicles with their own eyes as we keep pushing for legislation that governs their safe use across the country. This technology holds the potential to change our world far beyond our nation’s capital, but D.C. is an ideal place to continue building the foundation for a great service – one that helps free up our roads, ease congestion and improve people’s access to the services they need.